These Pads are used in a way that provides a covering for other products. These are designed in a way that is water resistant. 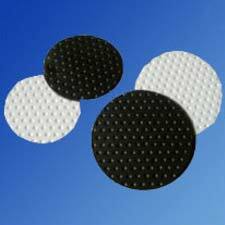 We manufacture these pads with a technology that makes the product resistant from outer disturbances especially water and acidic solutions. Also known as PTFE Dimple Sheet, PTFE Bridge Bearing Pads are majorly used in fast growing infrastructural projects like Metro, Railway Bridges, and Flyovers etc. We supply and export the PTFE Bridge Bearing Pads according to the customer requirement of the size and number.